Palazzo Casali was built by the Casali family that ruled Cortona in the 13th century and used the building as a residence until 1409. After 1411 the palazzo was named Palazzo Pretorio and occupied by the city’s Florentine captains. 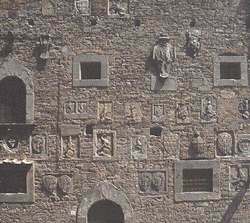 The coats of arms of these captains are still visible on the right hand façade of the building, on Via Casali, which has remained virtually unaltered. Major renovation works, including a new façade probably designed by Filippo Berettini, were carried out at the beginning of the 17th century. 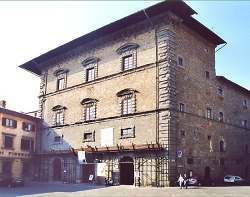 A century later the Grand Duke of Tuscany, Giangastone de' Medici, gave the top floor of the palazzo to the Accademia Etrusca,to house its Museum and Library. After the Unification of Italy most of the building was used as government offices, with the Accademia Etrusca still occupying the top floor. Following the restoration works carried out after the Second World War, the Accademia Etrusca took over also the first floor to exhibit its collections. The rear façade of the building, looking onto Via delle Carceri, is particularly fine. 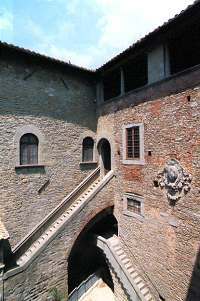 The main entrance of Palazzo Casali remains through the carved doorway built in 1638, that opens into a large atrium decorated with coats of arms and a courtyard that combines Medieval, Renaissance and 17th century details. Other elements worthy of note are the two staircases (the largest, 17th century, leads to the Museum, and the smaller to the Library and offices of the Accademia Etrusca), the sandstone fountain built between 1539 and 1540 by order of Bettino Ricasoli, and Medici coat of arms placed here by Francesco de’ Medici, governor of Cortona in 1570.